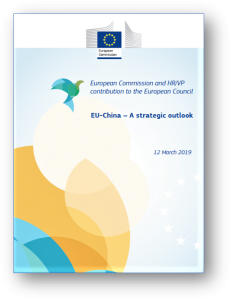 On Tuesday 9 April, Brussels will host the 21st EU-China summit. This time around, the underlying tone of the meetings may be slightly different than before, following the recent “Strategic Vision” submitted by the Commission to the Council. In its relations with the People’s Republic of China the EU is said to be unable to speak with one voice. It’s true that the recent decision of the Italian government to officially join the Belt and Road Initiative, or the eagerness with which several Central and Eastern European member-states have embraced China’s offer in an association known as the ‘16+1’, do not exactly point in the direction of a joint European position. This makes the ‘strategic vision’ published by the Commission on 12 March all the more interesting. The document has been widely commented upon, which is no surprise, given that it clearly takes no precautions to avoid hurting Chinese sensitivities. Identifying the PRC as a ‘systemic rival’ and openly reminding the extent to which its commitment to multilateralism is very ‘selective’ comes close to a ‘Copernican Revolution’ in attitude and tone, as François Godemont put it in a recent post. The rather dense document of eleven pages seems to spell the end of a certain European naïveté in its dealings with a major power that is simultaneously referred to as ‘cooperation partner’ and ‘economic competitor’. It lists a whole series of usual demands, for more reciprocity and fair-play, which at last should ‘demonstrate China’s commitment to a mutually beneficial economic relationship’. A sentence that certainly sounds almost aggressive to Chinese ears. Where does this spectacular turnaround come from? Tracing back the origin of some wordings in the Commission’s paper, we are tempted to link this change of strategy to a change of awareness and, consequently, doctrine in Germany. To put it bluntly, Germany is scared. Scared to lose its position as major global industrial player, to be overtaken in tomorrow’s most important economic sectors, and to lose its prosperity on the way. 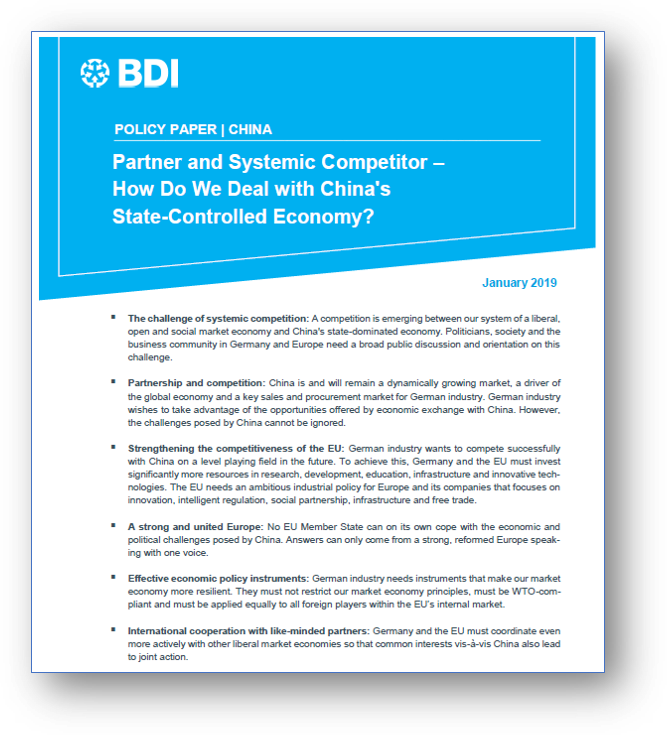 A policy paper published in January by the German Industrial Federation (BDI), bears the very term ‘systemic competitor’ already in its title. Asking ‘How Do We Deal with China’s State-Controlled Economy?’, the entire 23-page document is a call to Europe, punctuated by a list of 54 demands and propositions, to formulate a genuine European industrial policy in face of a ‘partner’ that is increasingly depicted as an ‘adversary’. 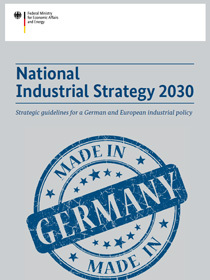 As early as February, this policy paper was followed by the publication of ‘Strategic guidelines for a German and European industrial policy’ for 2030 by the Federal Ministry of Economics headed by Peter Altmaier. This text, too, is very explicit about the efficiency of the PRC’s ‘Made in China 2025’ agenda and the threat it poses to ‘the industrial and technological sovereignty of our economy’. And it breaks with the traditional liberal doctrine by calling for massive public interventions in protecting German and European economic interests against China’s state capitalism. It also makes it clear that ‘German industrial policy must always be European industrial policy’, and that ‘the European Union needs a Council of Industrial Ministers’ in the near future. All this is rather new and might be interpreted as a “Mitterrand U-turn Moment”, though in reversal, and coming from Berlin. Nonetheless, it is perfectly in line with what leading voices in Germany have been requesting for some years now, especially after the purchase of the robotics firm Kuka by the Chinese company Midea in 2016. Economic leaders like Jörg Wuttke, for instance, the former president of the European Chamber of Commerce in Beijing, have repeatedly asked for a change in attitude among German policy-makers (see here or here). The same can be said about a new generation of researchers on contemporary China, who, according to a recent article by the GPPI’s Thorsten Benner, cast an increasingly critical and disillusioned eye on Xi Jinping’s neo-Maoist China rather than apply old perspectives of exotism and exceptionalism. It is possible that Germany has been cradled until a few years ago in the certainty of systemic superiority, like in the good old times of the Cold War when « Wandel durch Annäherung » – change through rapprochement – was based on the firm conviction that its Social Market Economy, anchored in a liberal, pluralistic democracy, would simply win in the long run. There seems to be a growing awareness in Germany today that what worked with its small Eastern German neighbours, will not be successful with the huge Chinese steamroller. Quite the contrary: it seems to be dawning on German policy-makers that in this new systemic competition, China might be the winner, by its sheer force and the ruthlessness of its governance. As Peter Altmaier has it in the above-mentioned paper: “this would have dramatic consequences for our way of life”. Visibly inspired by a change of mind in Berlin, the new ‘strategic vision’ from Brussels suggests that, more than ever, the German political class, across the ‘Grand Coalition’, sees the European Union as an indispensable multiplier of its own power resources on the global stage. In a world of increased great power competition and big data, scale is again paramount. Germany cannot make it alone, it needs the full weight of Europe behind. It also shows that in the quest for a ‘Europe that protects’, especially against external threats to its free-market model, the Merkel government is more aligned with Emmanuel Macron’s vision than it used to be (the words ‘protect’ or ‘protection’ appear thirteen times in the French president’s recent letter to all European citizens). 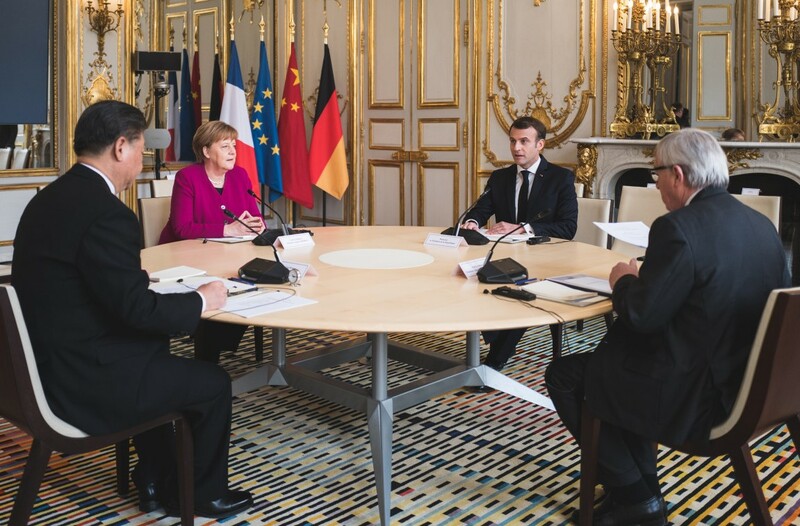 In this perspective, the unprecedented staging of Xi Jinping’s recent state visit to Paris, to which Angela Merkel and Jean-Claude Juncker were invited, definitely makes sense. And so does the new Treaty of Aachen (officially ‘Treaty on Franco-German Cooperation and Integration’) signed in January, and which may well turn out to be a new joint leadership impetus rather than a ‘weak’ and ‘exclusive’ symbol as some commentators wanted to have it). It remains more than doubtful whether Germany and France will be able to get a significant majority of other member-states on board in their new China strategy. But while the UK is absorbed in its self-mutilation and the Italian government overbids itself in provocations for reasons of internal power struggles, the Franco-German tandem at least offers a tentative road map. Having said that, Franco-German impetus is indispensable, but certainly not sufficient. If a European industrial policy is to work, it needs to be inclusive. The centres of decision making of the future European champions and innovation hubs cannot only be concentrated in Paris, Berlin, Stuttgart and Munich. The European “G2” needs to work with other key partners in the north and the south, starting with The Netherlands and Spain, and make sure it remains open to other countries who want to join in this more strategic endeavour. If it fails to be convincing, many will be tempted to abandon the EU core and drift towards Beijing and/or Washington. Published on 28 February 2019 by Albrecht Sonntag | Comments Off on Business interests and cultural perception patterns. A French region’s view on Brexit. Published on 26 April 2018 by Albrecht Sonntag | Comments Off on The railwayman’s dignity shall be inviolable. Published on 17 November 2017 by Albrecht Sonntag | Comments Off on Zeit fürs Gegenpressing! Published on 6 October 2017 by Albrecht Sonntag | Comments Off on Nation-building. Participant observation, June 2015.